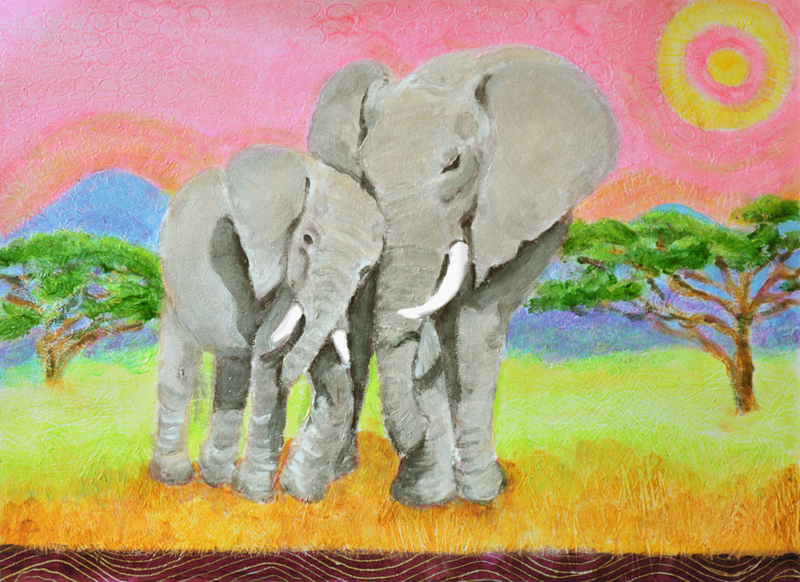 Mom and Baby Elephant is a recent painting for my Heni’s Happy Painting’s Etsy shop. Several people have asked for an elephant print. I love elephants myself and so I decided to paint one. I’ve chosen an African savannah scene with a mom and baby which will go nicely with the lion paintings. I have been thinking of Africa lately as my sister and brother in law were in Nairobi for a few weeks earlier this summer, she sent back photos and wrote about her amazing experiences there. One day I hope to travel to Africa also. I chose to paint a mom and baby for a couple of reasons. My other mom and baby painting of dolphins is the best seller of my shops. Moms love it for young children’s rooms and so hopefully this one will be popular also. I’ve been thinking about motherhood lately as my daughter recently graduated from high school and will be off to college soon. It’s been such a privilege for me to be her mom as she has grown from a baby to child to young adult. I’m excited for her next phase in life. My husband and I will be empty nesters, a big change for us too. This painting will serve as a memory for me of this time.